It's possible to run, be active and even do marathons when you have diabetes. In fact, it may even help you. If you have diabetes, here are a few tips to help you get inspired, put your running shoes on, and hit the open road. There are two main types of diabetes: Type 1 and Type 2. There is also another type that occurs in pregnancy called gestational diabetes. Type 2 diabetes is the most common with roughly 90 percent of diabetics with this type. Diabetes affects a huge number of the population, including 23 million adults and children in the United States (or 7.8 percent of the population) and about 2.5 million and an estimated half a million people who unknowingly have the condition in the United Kingdom. These numbers are on the rise particularly with the increasing rates of inactivity and obesity worldwide. Most shocking is the rising number of young people being diagnosed with Type 2 diabetes, which used to be a condition only associated with adulthood. When someone has Type 2 diabetes, their body doesn't make enough insulin or it doesn't use it properly. This is known as insulin resistance. Insulin is a hormone produced by the pancreas, which is responsible for controlling blood sugars, lipid and protein metabolism. People with Type 2 diabetes often have a strong family history and tend to be overweight with a high waist circumference, often a marker for intra-abdominal obesity and insulin resistance. Eating a balanced diet and exercising to lose weight are key to caring for Type 2 diabetes. To achieve a balanced diet, a person should eat meals rich in fruits and vegetables, use healthy oils such as olive oil, and eat lean proteins such as chicken or oily fish like salmon. Controlling portion sizes, especially carbohydrates, is also extremely important for diabetics. These simple changes can decrease the need for medication and insulin down the road. It can also decrease blood pressure and cholesterol levels, which are typically high in people with Type 2 diabetes. A good rule of thumb is to have a third of your plate with vegetables and salad, one-third lean meat, fish or beans and one-third wholegrain carbohydrates such as bread, rice and pasta. It is crucial to balance out carbohydrates as these get broken down into blood sugar. The key is to have regular portion controlled meals and snacks. Running with Type 2 diabetes is another great way to control the diabetes as exercise makes the body more sensitive to the action of insulin. "Increasing physical activity like running is great for patients with Type 2 diabetes as it could help decrease the need for insulin treatment in future," said endocrinologist Dr. Paul Gulley. Type 1 diabetes tends to have a more dramatic presentation and is diagnosed more often in children and young adults. In Type 1 diabetes, the body fights against itself destroying the insulin producing cells in the pancreas, therefore no longer producing any insulin. A person with Type 1 diabetes needs to take insulin injections as treatment for the rest of their life. Insulin products have improved in leaps and bounds and Gulley suggests that competitive runners use insulin pumps with a continuous blood sugar monitor. Jerry, a 50-year-old marathon runner from Arizona, was diagnosed with diabetes when he was 15 years old. He has always enjoyed running from a young age and has run a staggering 49 marathons and five ultra marathons. His favorite run is the Big Surf along the Pacific Coast Highway in California. In the early days Jerry was too afraid of doing a marathon for fear of hypoglycemia, or low blood sugar. Now he always checks his sugar before, during and after a run to make sure his levels are safe. Jerry says it is vital to take a meter with you. "I don't have any kind of diabetic diet except to try and avoid foods that make it more difficult to manage my blood sugar," Jerry said. "Other than that, I am continually attempting to match my insulin dosage with what I eat and how much I exercise." Lunch: Sandwich or soup from the caf? at work, sometimes a hamburger but if he has fries more insulin is needed. Dinner: roast chicken, broccoli and potato. During a marathon Jerry depends on energy gels—one every five to six miles. During an ultra marathon, he increases his intake. Nutrition is key before, during and after a race. "After a marathon I always like to eat right away," Jerry said. "There are several reasons for this not the least of which is the fact that I get hungry. I also know that refueling the muscles right away helps with recovery. It's good for me as a diabetic on an insulin pump." Jerry said he turns his basal level of insulin down before an event then balances it with food as he slowly increases it. This is to absorb the carbohydrates from the food to re stock glycogen stores but also to get his blood sugars leveled out. He eats bananas, granola bars, bagels or a meal replacement drink, which also has protein and is easy to digest. When you have diabetes it is important to work closely with your diabetes team to adjust insulin dosage. Dr. Paul Gulley says that if you're a causal runner who runs for 30 to 60 minutes, you should be fine. However if you are running for longer periods, it's best not to run alone. 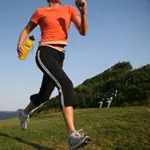 You should have a running partner or tell someone where you are running if you alone. Diabetic runners should always carry glucose tablets, diabetic identification and a meter. You need to "match calories in and burned with insulin." He also cautions his patients to be aware of the risk of dehydration in the summer months. Ensuring good diabetic control is important because if your blood sugars are too high to begin with, you're at a much greater risk of dehydration. "Diabetes is my constant challenge in everything I do," Jerry said. "It's not an excuse for not doing anything, but it's something I have to reckon with, something I have to plan to deal with." Jerry is part of a group called Triabetes. The group started with 12 individuals with Type 1 diabetes who came together to train and complete in the Wisconsin Ironman in 2008. This year, there are 15 members training for the Arizona Ironman. So if you're a runner of many years or just starting out be inspired by people like Jerry, anything is possible, plan ahead and have passion diabetes doesn't need to hold you back. The open road is waiting.